The recent announcement that dismantled the levy and monthly release mechanisms, in the sugar industry, will make the industry more efficient and competitive. But much remains to be done. This is a good time to look at the government interventions in this industry, the implications of recent decisions, and the way forward. Minimum price for cane: Under the Sugarcane (Control) Order, 1966 (SCO), the Central government announces a `Fair and Remunerative Price' (FRP) to ensure a good return to farmers. The state governments announce a `State Advised Price' (SAP) which has typically been higher than the FRP, thus making the FRP redundant. In 2010-11, the SAP was 47% higher than the FRP. Cane Reservation Area: To guarantee continuous and sufficient supply of cane to all mills, the area from which a mill can procure cane is reserved. It is also obligatory for the farmer to sell all produce to the mill in that area. The state has the power to reserve this area under the SCO. Minimum Distance Criterion: The Central government, under the SCO, has set a requirement of a 15 km. minimum distance between two mills to ensure supply of cane to all. States are authorised to increase this limit with prior approval from the Center. Punjab, Haryana and Maharashtra have a minimum distance requirement of 25 km. Levy Obligation: Under the Levy Sugar Supply (Control) Order, 1979, till recently, mills had to sell 10% of their produce to the government at a price lower than the market price, and this sugar was distributed through the public distribution system. Monthly release mechanism: The central government dictated the amount of sugar a mill could release each month in the open market, under the Essential Commodities Act, 1955 and the SCO. This allowed the government to control the prices of sugar in the market. In 2012, the release orders became quarterly. Trade Policy: To ensure national food security and contain price volatility, the government has historically used quantitative restrictions on export and import, depending on domestic and foreign conditions. Controls on by-products of sugar manufacture: Molasses is used to produce alcohol which is used in the production of potable alcohol, chemicals and blending with petrol. States impose restrictions on the movement of molasses, and artificially reduce the price for the benefit of liquor barons. The Center has not yet released a clear policy on pricing of ethanol for blending in petrol. The state also imposes restrictions on open access sale of power generated from bagasse. Compulsory jute packaging : The central government has made it compulsory for mills to pack 40% of the sugar produce in jute bags. These controls add up to a comprehensive central planning system that blankets the sugar industry. Each of these controls has created distortions. #1: The minimum support price aims to ensure a fair price for cane to farmers, but on the contrary, it is the leading cause of accumulation of cane arrears (Rs 5495.04 crore for 2011-12 sugar season). The SAP is often not commensurate with the market price of sugar, making it hard for the mills to pay the farmers in time. Farmers shift to cultivation of a different crop because of delayed payments and this leads to shortages of cane. With lower production of sugar and higher market prices, the mills are able to reduce cane arrears and this incentivises the farmer to shift back to cane cultivation and the cycle is repeated. The graph below shows these fluctuations. 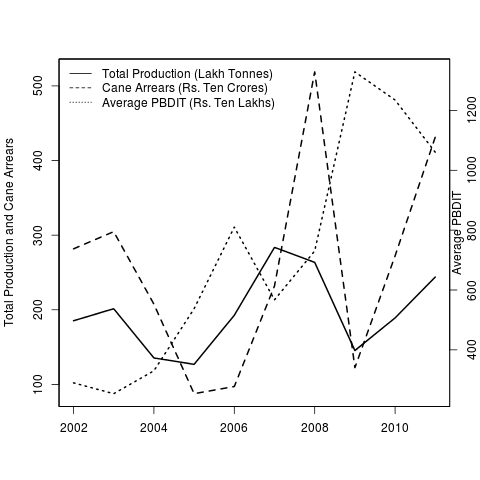 The figure above shows cyclicality in total production, total cane arrears and the average PBDIT of a balanced panel of 50 sugar companies observed in the CMIE Prowess database. There is a direct relationship between the production of sugar and the cane arrears, and an inverse relationship between total production and firm profit. This cycle is characteristic of the present restricted industry industry. 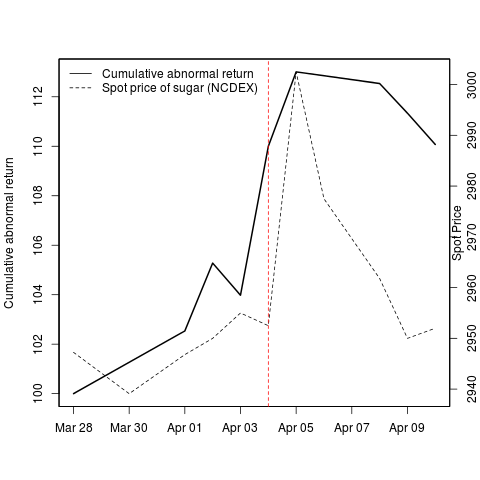 The price and supply of sugar are extremely volatile, even though consumption has been growing at a steady pace. The mills are often working under capacity and many small ones are shut down in the lean season since production is not economically viable. Farmers are burdened with delayed payments, and consumer welfare is reduced due to volatile prices. #2 and #3: The cane reservation area and minimum distance requirement have fostered creation of monopolies. The farmer is obliged to sell his produce to a mill irrespective of its past payment record and cannot search for the best price for his produce. This gives monopoly power and artificial protection to firms, and helps inefficient firms to persist in the market. Currently, there are approximately 500 mills, some of which operate only in times when the cane is in surplus, produce as little as 500 tonnes of sugar in a year, and have a very low ratio of recovery of sugar from cane. Moreover, these controls do not allow high productivity firms to expand and achieve economies of scale, invest in increasing the acreage and sucrose content of cane. #4 and #5: The levy obligation imposed a direct cost on mills to the tune of Rs.3000 crore in 2011-12. In 2011-12, the levy sugar price was Rs. 1904 per quintal, while the price of non-levy sugar was Rs. 2749 per quintal, excluding excise. The mills passed on these losses to consumers in the form of higher prices, and to farmers by delaying payments. The monthly release mechanism led to high inventory accumulation costs and made it hard for mills to manage cash flows. These two controls also incentivised mills to hoard inventory, increasing the administrative and litigation costs of implementing these controls. #6: The abrupt and unanticipated trade barriers in the form of duties and outright bans, has not achieved the desired reduction in price volatility. Besides the dead weight loss of restricting trade, the unstable policy regarding export and import has reduced the ability of mills to foster long term contracts abroad. #7 and #8: Mills lose money by selling molasses to liquor barons at an artificially low price. The unclear policy on ethanol pricing for oil marketing companies leads to unfulfilled contracts between sugar mills and OMCs and increases losses for both industries, since blending ethanol reduces the price of petrol for OMCs, and mills do not get revenues from the sale of molasses. The restriction on open sale of power generated from bagasse imposes an environmental cost. Compulsory packing in jute bags adds Rs 0.40 per kg of sugar. These policies, which try to develop one industry at the cost of another, eventually increase the cost for consumers and farmers. The Rangarajan Committee was appointed to study the issues related to regulation of the sugar industry in early 2012. They recommended phased decontrol of the industry. The recommendations include immediate removal of the levy obligation and monthly release mechanism, and phasing out of cane reservation area, minimum distance criterion and trade barriers over the next couple of years. Concerning cane pricing, the committee recommends that cane price should be a combination of FRP and a share in value of sugar. On international trade, they suggest that the current policy should be replaced by moderate duties not exceeding 5-10 percent. The need to deregulate the movement, pricing and quantitative restrictions on by-products of sugar, and abolish mandatory packaging or sugar in jute bags is also emphasised. The Cabinet Committee on Economic Affairs has recently approved the removal of levy obligation and the monthly release mechanism (#4 and #5), as suggested by the Rangarajan Committee. The markets welcomed this decision, with a cumulative abnormal return of the CMIE COSPI Sugar Industry Index of 9% over the 2 days after the announcement. The spot price of sugar also spiked after the announcement. The market was over-exuberant at the partial decontrol of the industry and some of these gains have been reversed. Impact on finances: The removal of levy implies a direct increase in profit for mills of about Rs.3000 crore since they no longer have to sell 10% of the produce at significantly low prices. With the freedom to release stock, the mills will have choices about selling in India and abroad. The mills facing financial problems can liquidate their inventory when needed. Reduction in cane arrears: Mills with large cane arrears will now be able to release stock to make pending payments. But as elections come closer, there is a possibility that the SAP is increased and cane arrears accumulate. This will hurt the financial health of the firms. Volatility in prices: If mills release too much stock to reduce cane arrears or due to sheer inexperience with a free market, prices might plummet. The strategic moves of mills, rather than decisions of politicians and bureaucrats, will determine prices. Greater trading: Since cane is crushed seasonally and the mills have full freedom to release sugar, the trading on futures market will matter more. The futures market will become much more important in shaping decisions of everyone involved in sugar. Survival of the best: Until now the government regulated the amount of sugar released in the market, and the firms had no experience in thinking strategically. Reaching a Bayesian equilibrium will involve learning by doing, and creative destruction in the industry. Mills will require building up financial depth and skills in hedging using futures. Large firms, which have diversified into production of power and alcohol, will have an upper hand. 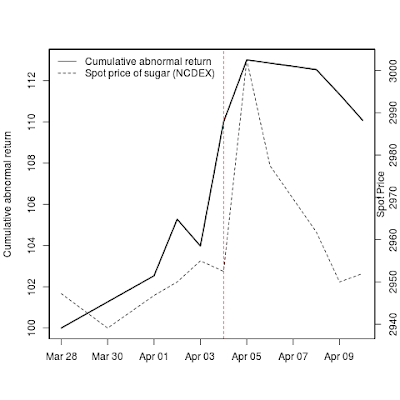 Stability in acreage and cyclicality: The ability to manage cash flows would increase the security of payment to farmers, incentivising them to continue with cane cultivation. The mills and farmers (in the area reserved for them) might enter into contracts where the supply of cane is guaranteed, in return for timely payments. This can considerably reduce the amplitude of the sugar cycle and lead to an improvement in cane acreage. Impact on the growth of sector: With a better balance sheet, mills will be able to invest more. The global perception of the industry is going to change from highly regulated to partially decontrolled and this might give greater foreign investment. The freedom to release stock in domestic and foreign markets (provided export policy is not binding) will increase the international presence of mills. Of the list of eight controls, the government has removed two. Most of the pending controls come under the purview of the state governments and decontrol of this industry is now largely their task. #1: Reforming the regulation of price is essential to reduce cyclicality in cane production, which is a leading cause of cane arrears and low profitability. The recommendation of the Rangarajan Committee on pricing of cane suggests that the farmer will be better off as he is protected from uncertainty in the market due to a guaranteed FRP, and also encourages him to invest in increasing the yield of cane for he has a share in the value. #2 and #3: Abolishing the minimum distance requirement and the cane reservation area will lead to competitive bidding for cane and farmers would be able choose the best price on offer across an array of choices [analogy]. The increased competition to acquire cane might encourage mills to enter into long term contracts with farmers and offer them other benefits such as timely payments irrespective of the phase of the cycle, make them shareholders, and also assist in increasing cane yield. The inefficient firms are likely to perish with more competition in the market, leading to a more consolidated industry. #6: Removal of trade barriers is likely to make trade more stable, foster global relationships between firms and make Indian firms internationally competitive. In the recent past, imports were duty free and export release orders were removed, suggesting that the government is slowly liberalising trade. #7 and #8: Decontrolling movement, pricing and allocation of molasses can contribute significantly to the reduction of cyclicality in the sugar industry. In years of a bumper stock, cane can be used to produce molasses directly and can be distributed to all players at competitive prices. This will also make the sector more profitable. Co-generation from bagasse can become a reliable source of power. Removing restriction on sugar packaging will lead to a direct cut in costs of manufacturing. The government needs to hasten the process of adopting the Rangarajan Committee recommendations. The job of the government is to focus on public goods, such as improved road and rail networks for the transportation of a heavy and perishable good like cane, improved irrigation facilities to reduce the dependence on monsoons and improved information dissemination for price discovery. Market forces will furnish higher efficiency and growth in the system by ensuring the survival of the best firms, fostering mutually beneficial contracts between the farmers and mills, and stabilising the price of sugar for the consumers. This article has greatly benefited from suggestions from Dr. K. P. Krishnan, Dr. Ajit Ranade and Dr. G. S. C. Rao. I am amazed that sugar continues to be a controlled commodity. It is neither essential nor desirable. In a country suffering from diabetes at an epidemic level, consumption of sugar needs to be actively discouraged and cultivation of alternative crops encouraged. As a cash crop, there is no place for Government in sugarcane cultivation and sugar production.